Arts and business need to come clean over 'dirty money' | Daily Review: Film, stage and music reviews, interviews and more. The protest group Generation Alpha yesterday “poisoned” an artwork at the Gallery of Modern Art in Brisbane. 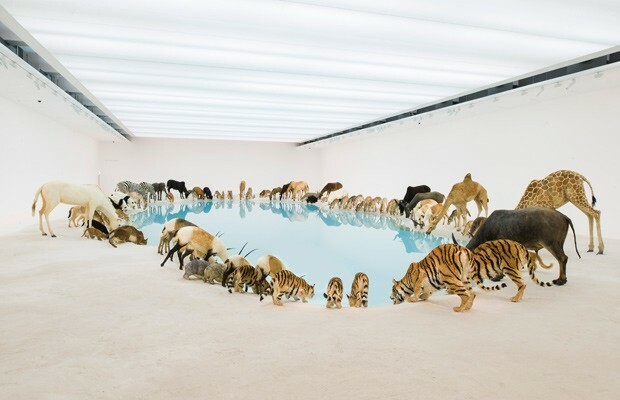 It was not affronted by the New York artist Cai Gou-Qiang’s Heritage, which features 99 life-sized, stuffed animals surrounding a pristine lake. No, its target was GOMA’s biggest corporate sponsor Santos. Generation Alpha claims Santos is “poisoning” the Pilliga Forest in north-western NSW where its coal seam gas project was found to have contaminated an aquifer with uranium at levels 20 times higher than safe drinking water guidelines. The Alpha protest saw a man dressed as a koala stand in front of the artwork, drink a cup of contaminated water and collapse and “die”. The protest was to highlight the belief that koalas are at risk from Santos’ activities and to illustrate GOMA’s acceptance of Santos’ “dirty money”. Yesterday’s protest (and more are planned) comes days after the giant Transfield group reluctantly withdrew its long-time support of the Biennale of Sydney because some of the artists participating in the event objected to the company’s involvement in running offshore asylum seeker detention camps. Both companies are the kind of corporate citizens the Federal government-backed Creative Partnerships Australia encourages to give to the arts. CPA was formed last year after the merger of the Australian Business Arts Foundation and the Australia Council’s Artsupport branch. Its job is to assist arts companies become more “sustainable” by sourcing funds from businesses and philanthropists who are attracted by the arts and the tax deductions that come with their donations. “It’s a very rare thing for a company to come and offer money to an arts company. It’s the other way around,” said CPA chief Fiona Menzies succinctly summing up that sometimes marriage can be an unequal relationship. 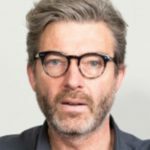 Much of the discussion around the Transfield pull-out has been about how the actions of those 51 artists of the 91 in the Biennale might jeopardise the future of arts sponsorship – a claim the artists rejected today in a wide-ranging statement — but Menzies admitted it had become a concern for donors. “I have had discussions with a large number of business people and philanthropists and they are expressing their concerns to me. I haven’t had anyone say ‘we will pull out our money’. It’s more that people are passionate about the arts and they are concerned a small group is jeopardising that. “This talk of ‘dirty money’ is very simplistic. When you look at business organisations they have mostly good intentions,’’ she said, arguing that as good corporate citizens they support a healthy culture as it helps build a healthy society and by extension, a healthy economy. Given that CPA seems to be sitting in the eye of the storm between business and artists it’s surprising its CEO said she didn’t want to comment on the details of the Transfield retreat from the Biennale. Menzies is not too concerned by Senator George Brandis’ recent outburst that arts companies should not be able to “unreasonably” reject sponsor funds. “I am not surprised by his comments given he has publicly said many times that he wants organisations to increase their private sector support. He wants arts organisations to be more sustainable and have more diverse sources of income,” she said. How Brandis’ suggestion would work in reality is anyone’s guess. Menzies agreed that even if, for instance, Circus Oz rejected sponsorship from a condom manufacturer, it would be unlikely the family friendly company would deal with Senator Brandis’ censure. “Before a sponsorship agreement there’s a lot of discussion and a lot of thought to make sure both sides benefit,” Menzies said. But if anything concrete can come from the recent sponsorship stoush, it’s that art companies need to be clear-eyed about the sponsors they choose to get into bed with. Arts company boards need to formulate ethical guidelines to avoid the disaster that the 2014 Biennale has become. Menzies said corporations have clear guides as to what they will, and will not, support and so why shouldn’t arts formulate their own guidelines? The ‘disastrous’ boycott of the Shitney Banality is inspirational. Finally art’s power might inspire and aspire to a reality beyond an unethical and immoral crapitalism. For it is not retaliatory gestures but corporate sponsorship’s symbolic poisoning proving to be art’s death-knell. “More sustainable” talk about the emptying out of meaning from a word, what does that even mean? Obviously Menzies is not referencing environmental sustainability. Perhaps she means sustainable as in able to survive in a world where the federal government runs a crypto-fascist agenda where private cash is King, ‘arms length government sponsorship of the arts’ is a polite reference to a by-gone era and artists are better seen but not heard. God I hate predictive text and fat fingers on iPads! Sorry I got so upset by that Menzies person I forgot my main point. We are facing a real revolution in what art and culture are. With a wised up and increasingly sophisticated public, earned with social media and new technology, we no longer need elites telling us what to like and how to think. It’s a democracy people. If you really want art so special and sanctified and unsullied why nit just go to an actual Church? They need the numbers. Please everyone ask yourself what is art to you personally. Maybe like me you find you don’t need the art clergy and Givernment waged hangers on to have a direct link to art. In fact you don’t. And we certainly don’t need corporates and rich people dealing in tax payer funding Inulgences! Go on, bite the hand that fed you in the back! Umm Humphrey artists and art works are symbolically ‘poisoned’ all the time. Individuals are stained by the actions of politicians and corporates all the time. Critics and commentators like us do it all the time. Tony Abbott saying he wants to spy more on us NSA style is a stain or poison exerted on our own bodies. Now we may be being poisoned by the plastic packaging of our food (I’ve always wondered at that) and diesel fuel is linked to cancer etc etc. Art is a Symbolic zone so it is powerful when a non-art activist group wants to take a symbolic gesture. It shows the success of the most radical aspect of contemporary art, once we bestowed any object or piece of the world the same importance and meaning as we once gave to formerly very aristocratic and rare objects (such as paintings and sculpture) then we also allowed the concept that everyone can make powerful and heartfelt creative gestures, with new digital technology literally anyone has the means to become an artist if inky for a short time. This is the great dilemma Ray indirectly addresses above. The Gillard Government set the quango (CPA) with an overly generous $5 million (a lot of fancy glitzy events for rich people there) to woo sponsorship (mainly tax deductible) and perhaps unwittingly they reinforced the same wealth decides taste mindset that always existed and that Fiona Menzies kowtows too. How can she not it’s her job and mortgage at stake. But there was always a huge problem with this mindset. Firstly it put the art and artists last, only a select few would ever be invited to eat and drink the tax payer funded champers and nibbles offered to the already rich enough to but their own champagne and nibbles. AND remote importantly and outrageously the Gillard and now Abbott governments (let’s face it they are the same, we live in a one part State) doubly or triply patronised the general public! They don’t get to drink the champers, they get rich people dictating what art they look at, the public get condescended to by arts public servants and infantilised by baby crèches and over 50s ‘evenings’ etc. the public is also used as the sole reason for all this expense needed to run the entire elitist edifice as only the audience attendance numbers really cut it with the politicians and their allocation of the public’s money. THE ENTIRE THING IS ONE BIG SCAM!!!! I know, I’ve been in it for 30 years. If Menzies and her ilk thing that the vast majority agree with Government manipulation and corporate whims and tastes then Fiona Menzies needs to back up her, in my view, false and self seeking claims. Furthermore every decision in the Arts, either funding or real prices paid for museum acquisitions or who chooses what and from whom and why needs to be totally TRANSPARENT! That is the only way the public and artists can know what’s actually happening. The Greens should push for an inquirers into art funding as only they would.LNP and Labor are the same party so no use there. It all stinks and everyone knows it. Fiona Menzies is one of women we’ve all met so often in the arts and we run a mile from. God help us! Ray, I wholeheartedly agree that arts organisations need to have ethical guidelines. I’m not sure I agree that the Biennale has become ‘a disaster’. Manus Island is a disaster. That said, I don’t support the retaliatory ‘poisoning’ of artworks. In contrast I don’t think the Biennale artists pressured anyone who didn’t agree with their views, but simply acted according to their own consciences – and achieved their objectives.